The Scriptorium links to an excellent review of the young Buckley's book using the following sentence as a link: "Christopher Buckley tried to write a book about Mum and Pup but ended up writing the first draft of a religious memoir about his own unbelief." The only son of two outsized individuals, Christopher vainly sought his father's attention and approval, chafed at Bill's public role, and nursed a secret knowledge of his limitations. Today, the world knows that his father was no saint. Despite the occasional laughs, this reader wishes the author had filed the manuscript away and waited for the gift of time and perspective. It would have been a better book. Update 2/26/08 - For a picture of Buckley in his office, click here. See the splendid review article by Linda Bridges and John R. Coyne, Jr. published in the Spring 2008 issue of the Claremont Review of Books. It's a dandy read. My additional posts on Buckley can be found here. ** NOTE: SOME SEARCH ENGINES BRING PEOPLE IMMEDIATELY TO THIS POST RATHER THAN TO THE MOST RECENT BLOG POST. I DON'T KNOW WHY THAT IS SO. THIS BLOG COVERS MANY TOPICS. FOR THE MOST RECENT BLOG POSTS CLICK HERE. had on my shelf but never got around to reading until now. I find it fascinating. So far as I can tell, little has changed since he wrote it back in 1951 as a 25 year-old Yale graduate. As I wrote before, for years I greatly appreciated his television program, Firing Line. What follows are more reminiscences (mainly from the National Review website) to add to a previous post. 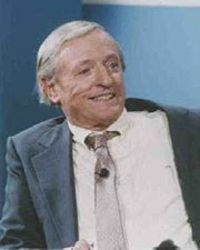 Here, for the first time, Buckley writes at length about his faith, about some of the principal obstacles to Christian belief (despite self-deprecating comments concerning his lack of theological training, he displays considerable powers as an apologist), and about the distinctive experience of a Roman Catholic in the twentieth century.